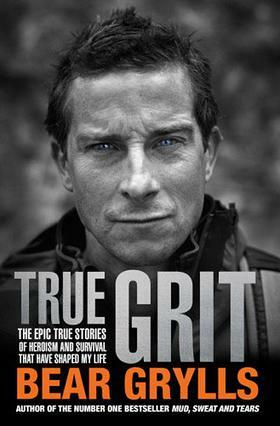 Bear Grylls' new book, True Grit, is more than just another book about heroism and survival. It is a series of tales of how the ordinary had to step up to become extraordinary, and more importantly, how we can learn from their lessons in everyday life. If anyone knows about bravery, it’s Bear Grylls. We may know him as the slightly crazy TV presenter of shows such as Man Vs Wild, but he runs a little deeper than that. He’s a former SAS soldier, honorary Lieutenant Commander of the Royal Navy, Chief Scout to the Scouting Association, an Ambassador for Global Angels, Vice President for the JoLt Trust – which takes disabled and disadvantaged children on expeditions – and a supporter of Comic Relief, the Royal National Lifeboat Institution, Hope and Homes for Children and the ONE Campaign. True Grit takes us into the minds of people who have been to hell and back. Divided roughly into sections such as “Exploration”, “War”, “Climbing”, and “Antarctica”, the book leads us through a maze of Bear’s heroes, influences and inspirations. Some of the stories are well-known – such as Nando Parrado’s tale of survival following a plane crash in the Andes immortalized in the movie Alive, Joe Simpson’s harrowing account of near-death told in Touching The Void, Aron Ralston’s self-amputation in 127 Hours, and the stories of Scott of the Antarctic and Shackleton. But scattered among them are the lesser-known gems of Chris Moon’s battle against land mines, Juliane Koepcke’s plummet from 10,000 feet to the Amazon rainforest, and Navy SEAL Marcus Luttrell’s tale of survival in the harsh mountains of Afghanistan. Bear uses each story to remind us how these lessons can be used in our own lives. How the human spirit is a glowing ember in all of us. How the courage to forgive is just as important as the courage to endure hardships. He reminds us that life is a gift to be savored, something to cling to through the storms it throws at us. He teaches us that even the ordinary has true grit. True Grit is available through Amazon.com and Amazon.co.uk.